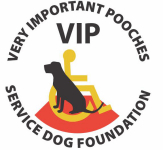 Welcome to VIP Service Dog Foundation Owner Participation Program. VIP is a 501c(3) non-profit charity organization who facilicate service dogs and companion dogs to developmentally disabled, physically disabled individuals. Our dogs assist disabled individuals with everyday activities. Both service dogs and companion dogs are available. Veterans are encouraged to apply. To donate to the veteran service dog program please click on veteran donation page.